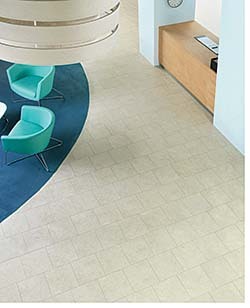 Spacia Dry Stone Alba's sandy mottling evokes the image of a white sundrenched beach. Available in 12-by-12 inches, 12-by-18 inches, and 18-by-18 inches. The design has a soft embossed ceramic finish, urethane coating and beveled edges.